The radio can operate as previous models have. The expansion and preprogramming of the Repeater List allows for “choose your repeater and talk” operation. The steps to easy use aren’t necessarily obvious to new users. On this screen, the left hand side is highlighted in black to denote which field that you are changing, the TO or FROM field. The display above indicates that we are changing the FROM field. Rotate the volume knob until your local repeater is selected. (we’ll show you some shortcuts in a second). Hit the up (RX-CS) or down (DR) button to select the TO field. Rotate the volume knob again until you get to the desired destination. Yes, as you scrolled through both the TO and FROM fields, there were probably a large number of entries of systems that you don’t care about and they were seemingly in no order. Let’s find a simpler way than scrolling through all of the systems. Hit the up (RX-CS) or down (DR) button to select the FROM field. Select the Repeater List by using the up (RX-CS) or down (DR) button or the Volume knob then press the center blue button again. You should now see a list of repeaters within your region. You can use the volume control to rotate though the list. On the bottom line, the State/Province/Country will be displayed along with the call sign of the repeater. Use the center blue button to select your repeater. If the GPS is enabled and actively receiving position reports, you may also use the Near Repeater function. The ID-31A will list the nearest repeaters to your current location. You may then easily select the closest repeater to you. This is the tricky one. For most repeaters worldwide, the best option is to use YOUR CALL SIGN. Then you can start talking! You are now on the air. This information comes preloaded on some models of the radio. 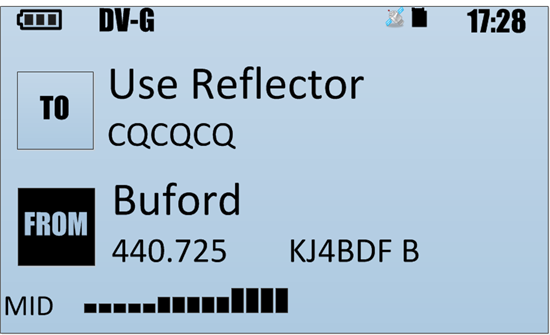 “Use Reflector” is configured in some pre-loaded radios as CQCQCQ. This correctly configures the radio to append a G to the RPT2 callsign. I'll have to put this radio on my list of new toys. and if it is about the same size as the 91AD and 92AD? I wrote the comment above thanking you for advising use of the USE REFLECTOR setting. Sadly, At a local D-Star lunch the next weekend, some know-it-all reprogrammed my ID-31A and deleted that option! Can I program a memory slot to restore a USE REFLECTOR? Just entering "Use Reflector" does not do it. HELP!! !